Dewalt has announced that they will be coming out with a whole new line of professional-grade locking pliers. 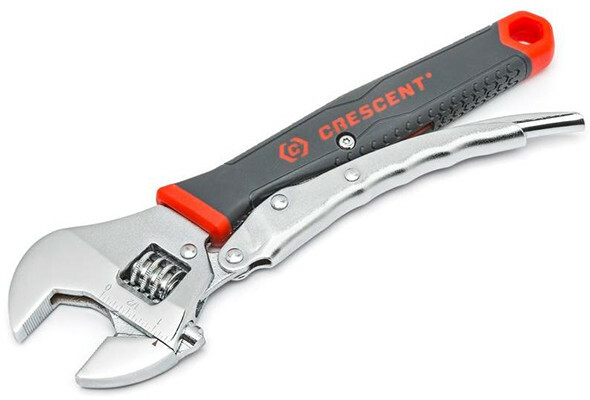 The new pliers are made from chrome vanadium steel with a tough corrosion resistant finish, and feature a new Tough-Lock locking feature to help prevent unintentional release. Dewalt’s newly designed locking pliers feature aggressively toothed jaws. This helps improve gripping power, but will also increase the extent of damage or gouging the pliers will inflict on worked objects and materials. The pliers will be approximately priced at $13 (7″ sizes) and $14 (all other sizes and styles), and will be available at mass retailers and independent retailers starting in December 2013. 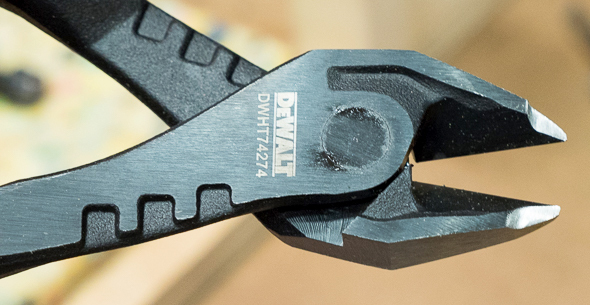 Update: Dewalt’s new locking pliers are “on hold,” with no expected release date yet. At these prices, the new locking pliers are almost certainly made in China. These new Dewalt locking pliers look to be bulkier and more aggressively toothed than the Grip-On and Vise Grip locking pliers I use and love. The Tough-Lock secondary lock is an interesting feature, but I can’t say unintentional or premature handle release is an issue I have much experience with. Maybe it’s something I have come across but did not take note of. I find it interesting that the curved jaw pliers have angled teeth. If the pliers are used to rotate a hard-to-grip material, the material might slip across some of the teeth. But on the other side, the opposing angled teeth might dig in deeper. So where’s the advantage compared to the not-so-aggressively-toothed locking pliers already on the market? Every once and awhile you come across a a nut or bolt that’s really stuck and even original vise grips will slip… These aggressive teeth might just do the trick in those really sticky situations, the marks they might leave to me don’t really matter unless it’s something that people could obviously see… For the money I might just grab a pair and give them a try…. For really stuck-on fasteners, I typically reach for a 1/2″ drive breaker bar, 6pt socket, dead blow hammer, and safety goggles, but I suppose locking pliers take up a lot less space in a fieldwork tool bag. For stuck-on fasteners, I would be more inclined to use Vise Grip’s 7″ locking wrench (< $13 via Amazon), or perhaps their 10″ version, instead of toothed curved-jaw locking pliers. Pro Tool, Made in china. Humorously, I bet that the average consumer that buys these at Home Depot or Lowes probably won’t even look to see where this tool was made. For $13 or so, one could go on eBay and find sellers that offer American made locking pliers at times for much less. Often times for that price they won’t be new, but there is a good chance they will last years, upon years. So that is a pass for me as well. I would be in agreement with you if you swapped if you buy from a well known company with if you buy from conscientious brands. Just because a company is well known or even reputable, does not mean their imported tools will be good quality. In my experience, Dewalt and other Stanley hand tool brands have proven themselves to be conscientious about tool quality. That is, I generally find myself able to trust Stanley/Dewalt/Proto/Blackhawk/Facom/etc. quality, regardless of where the tools are made. I hope that this will carry through with the Bostitch branded hand tools. I recall seeing some Bostitch ratcheting adjustable wrenches at what looked like clearance prices in Lowes – and after a quick look at them I could see why they might have not sold well. Maybe – not exactly a quality issue unless you consider good design as part of the quality equation. i have found newer chinese vice grips to be inferior to the vice grips of old. a rep from vice grip contacted my through the garage journal last spring and admitted as much to me. not something that exactly instills confidence. he offered to send me new and supposedly improved versions to try. as of yet i have declined. Nobody goes to China to make better tools. They go to China to make cheaper tools. Couldn’t say this better myself. These modern day Irwin Vise Grips don’t measure in the slightest compared to vintage Petersen or when they became American Tools. There is absolutely no way I would ever buy any modern Irwin Vise Grips, even if cost next to nothing. As to me personally, these modern day Irwin Vise Grips are nothing more than cheap metal in my opinion. I am not anti imported items in the least, as I own several items that are made overseas. However, with locking pliers, I rather own Petersen/American Tools branded locking pliers, as they truly are built to last. I still own the first Petersen Vise Grip I bought in the early 80’s and decades later, this tool works just as well as this did the first day I bought this. I don’t think the same can be said about modern day Vise Grips. I most often use locking pliers to extra broken screws from scenery and stage decks. Aggressive teeth would be useful to me. Do you happen to remember the Vise Grip reps name? I know how the IRWIN organization is set up and they don’t have Vise Grip Reps.
yes, i know who he is. i could tell you his screen name, his real name and his position with irwin. he gave it all to me via a private message at the journal and i have it saved. with that info i was able to get his phone number through the irwin website. i had a long visit with him on the phone and discussed many issues. my calling him a vice grip rep was probably not correct but it got my point across. have no doubt, he is a real person and we had a real conversation. i don’t feel it is up to me to identify an irwin rep by name and using his actual title may put him in a position he does not want to be in. if stuart wishes to get more info from me he is free to do so and knows how to contact me. cp, i actually just went back and reread my 3 messages from him. he gave me his full name, email address @ newallco.com, his work phone number and cell phone number. i sense some sort of doubt from you that i actually talked with someone but i assure you i am not making this up. he is just one of several people from several companies i have had contact with over the years. i have had opportunity to use and get several tools to use and keep before being available to the general public. two examples being triangle tools with the nano ratchet, sockets and accessories and with montezuma mfg and the crossover tool box. i would not put my contacts or my reputation in jeopardy by making things up. Soooo…December 26th and I’m not seeing these anywhere….Are they waiting until the last day of the year to release these? Maybe they’re waiting until after the current $25 off $100+ promo ends?